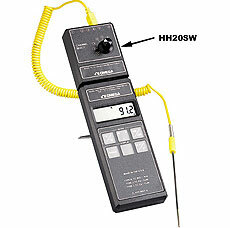 The HH20SW is a compact, economical switchbox that lets you use your handheld meter with up to 6 probes. A subminiature connector mates quickly and easily to most handheld thermometers, and can slide from side-to-side for use with single and dual input thermometers. The HH20SW accepts 6-subminiature (OMEGA™ SMP) male thermocouple connectors; a rotary switch lets you select the input channel quickly and easily. The HH20SW will operate with many OMEGA™ thermocouple handhelds.